History-making multiplatinum superstar Lil Pump shares a new song and blockbuster music video entitled “Racks on Racks.” This morning, the World Record premiere of “Racks on Racks” was presented by Zane Lowe on Beats 1 with an exclusive interview, check it out on Apple Music now. The song heralds the arrival of his anxiously awaited full-length debut and one of the year’s most anticipated albums, Harverd Dropout, coming February 22 via Tha Lights Global/Warner Bros. Records. Once again, “Racks on Racks” explodes out of the gate with all of the uncontainable energy, wild charisma and chantable hooks Pump remains synonymous with. Over lively bass-heavy production, he switches up his flows from kinetic verses into a resoundingly catchy chorus. To accompany this anthem, Pump also uncovered an equally explosive music video this morning directed by BRTHR. 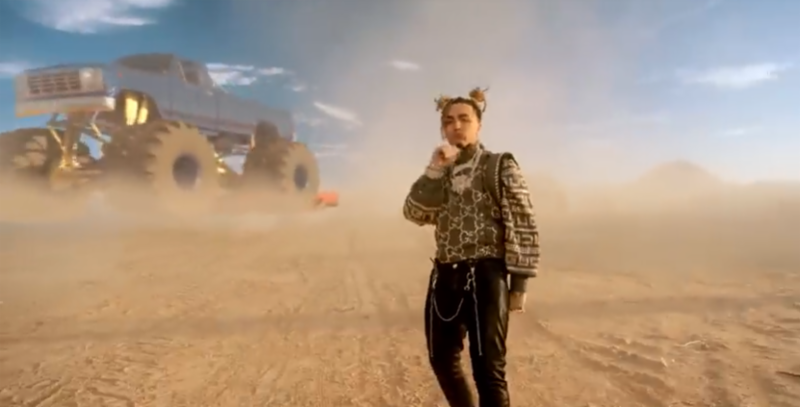 In the desert-set clip, he turns up flanked by a Mad Max: Fury Road-style tribe of vixens wielding flame cannons and a whole lot of fire. To top it all off, a monster truck rolls by, elevating the video to another level altogether.